6kW solar systems are becoming increasingly popular amongst Australian homes thanks to a number of factors, including their affordability and ample size. This article provides an overview of (almost) everything you need to know if you’re considering a 6kW solar system for your household, including pricing, energy yields and their attractiveness as an investment. How many panels in a 6kW solar system? How much area required? A modern-day 6kW solar system using 250 watt (W) to 320W modules will consist of about 19-24 panels. Each panel generally measures out to about 1.7m2, so the roof area required for a 6kW system will be about 33-40m2 – or possibly more depending on how your roof is laid out and whether you require tilt frames (which need to be spaced out more than panels mounted flush on the roof). Are 6kW systems the new 5kW system? Although your system may have 6kW worth of solar panels, don’t be surprised if the proposed inverter for your system is only 5kW. 5kW solar systems are also incredibly popular in Australia for a number of reasons (including the fact that that size is pre-approved for grid connection on basically every network in the country), which means that 5kW inverters are much more common to come across than 6kW ones. Many of the 6kW solar systems on the market are therefore ‘overclocked‘ systems with a 5kW inverter. This is perfectly legitimate within Clean Energy Council guidelines, with benefits such as greater solar energy yields in early morning and late afternoon – even if ‘peak’ production is clipped back to 6kW during the middle of the day. How much does a 6kW solar system cost? 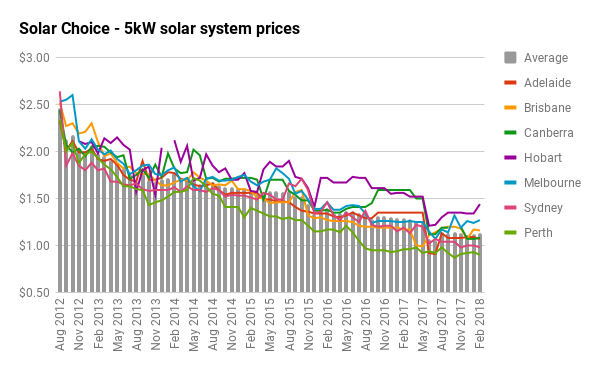 Average 5kW solar system prices (per watt of capacity) in each Australian capital city, from August 2012 to early 2018. Historic 6kW system pricing trends should follow the same lines. In Australia, the average retail price of a standard solar PV system installation of mid-range quality is a bit above $1 per watt, after federal government solar rebates are taken into account. This means that at the time of writing (Feb 2018), the cost of such a 6kW solar system is around $5,500-$7,500 – significantly less than what it would have been even just a few years ago. The price of solar systems do, however, vary widely in the market. A more cost-competitive 6kW solar PV systems consisting of cheaper, low-end products will be cost less, while premium offerings will generally be pricier. How much energy will a 6kW solar system produce? Location is one of the main determinants of solar system energy yields, as the amount of sunshine falling on a solar system’s solar panels directly affects the system’s output. The table below provides rough approximations for how much energy a 6kW solar system will produce, based on Bureau of Metorology and PVWatts data. Please note that these figures are indicative only and that we have endeavored to be conservative in our estimates, using a system efficiency rate of 75%. Also note that these figures are annual averages – in reality, energy yields will be higher in the summer and lower in the winter. Batteries with a 6kW solar system? More and more households have battery storage in mind when they purchase a solar system. The smallest size we generally recommend you install if you’re considering batteries either now or in the future is 5kW; a system of this size will generally provide plenty of surplus energy for storing. At slightly larger than 5kW, 6kW systems would also be a good size for batteries. Is solar battery storage worth it in 2018? How long is the payback period on a 6kW solar system? The benchmark by which most solar shoppers measure their panel’s performance is the payback period – the number of years that the system will take to ‘pay for itself in energy bill savings & feed-in tariff credits. Keep in mind that returns may be better for systems whose price points are lower, or if you achieve a higher level of solar self-consumption. But also be mindful that you’ll want to be selective about the products and companies that you consider – some deals are too good to be true. Ready to shop for solar & batteries? Compare quotes from installers in your area. Since 2008, millions of people have accessed Solar Choice’s website to educate themselves about their solar prospects. We’ve also helped over 125,000 Australian households & businesses make an informed choice about selecting an installer with our free and impartial Quote Comparisons. Looking at getting solar and the more I do the more confusing it seems to be, no two quotes alike. Everyone else has quoted using a 5 kw inverter and I am advised while a bit more expensive it will in the long run give me more of a return on a cheaper electricity bill. If you are able to offer any advise I would indeed be grateful. Solar panel arrays are allowed to be oversized relative to the inverter capacity – so a 5kW inverter with 6kW worth of panels is relatively common these days. When you take this approach, your solar system will produce a bit more energy in the mornings and afternoon, but will flatline in the middle of the day, when the sun is at its brightest. The overall effect is that you get more energy out of a 6kW solar panel / 5kW inverter system than you would out of a 5kW panel / 5kW inverter system – especially during the times that you’re likely to use it (morning & arvo). This approach is particularly attractive for two reasons: 1) Some electricity networks only allow up to 5kW of inverter capacity to be connected without extra red tape, and 2) 5kW inverters are very common and therefore often less expensive than other ‘niche’ sizes because of the amount of competition in this size range. So you might find a a good deal in a system that oversizes the panel array. It sounds like the 6.8kW Canadian / 6kW Fronius inverter setup that you’re currently leaning towards is a decent quality system – on the ‘premium’ end of things. According to our pricing figures, a ‘premium’ 7kW solar system retails for about $1.20 per watt – or about $8,400 on average nationally (we don’t have specific pricing for 6kW systems, so I encourage you to check out the table and look for your nearest capital city). I also note that this price doesn’t include extras like monitoring, so that could explain the higher price you’re looking at (and also: some places have higher overall prices – especially VIC and TAS). What is the rebate rate of the solar power installed 2 years ago? Is there a better deal with any of other company? Do you have a list I can select from? I think you’re referring to feed-in tariffs as opposed to a rebates. Regardless the options available to you will depend on what state you live in. Unfortunately, we don’t have a comprehensive list of what’s on offer from energy providers as we help people get the best solar PV installation deal for them. I’d recommend you have a look at a comparison site for energy company’s. As a rough guide, the base level in NSW two years ago was 60¢ per KWh, although energy retailers did offer various options to encourage people (like yourself) to switch. There is currently no mandatory feed-in tariff in NSW so switching to another energy provider may result in you loosing the 60¢ rate, the best on offer in NSW is now 8¢ per KWh! If you speak to AGL they may be able to tell you why the rate was dropped and their competitors may by able to advise as to whether you will still be eligible for the earlier Premium tariff. Sorry we can’t be of more help, good luck! Thank you for your independent assistance as there is so much information that I obviously don’t understand. Thanks for the comment. Both premium and bottom-shelf solar products come out of China, as well as a number of mid-range ones. The old motto goes ‘you get what you pay for’. We’ve had many a customer who has gone ahead with systems that use Chinese components and been happy with them. There may be more of a guarantee of quality from European brands, but with a bit of discrimination it is also quite possible to find quality components with a ‘Made in China’ label. 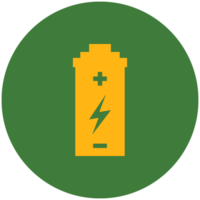 Previous post: Battery storage: Are Australian households about to charge into market?